Well, on the MOTM mailing list I'm known as Moe sometimes, and there's also a Larry, a Curly, and a Shemp. I guess you had to be there<g>... Since I stink at thinking up imaginative names for projects, I called it SuperMoe. Why build a sequencer yourself? I have designed a series of modular analog step sequencer components (dubbed SuperMoe), for my MOTM synthesizer. Why? Because there's nothing available in the MOTM format yet, because nothing is being built today with the combination of features and technology that I want, and because it's fun. 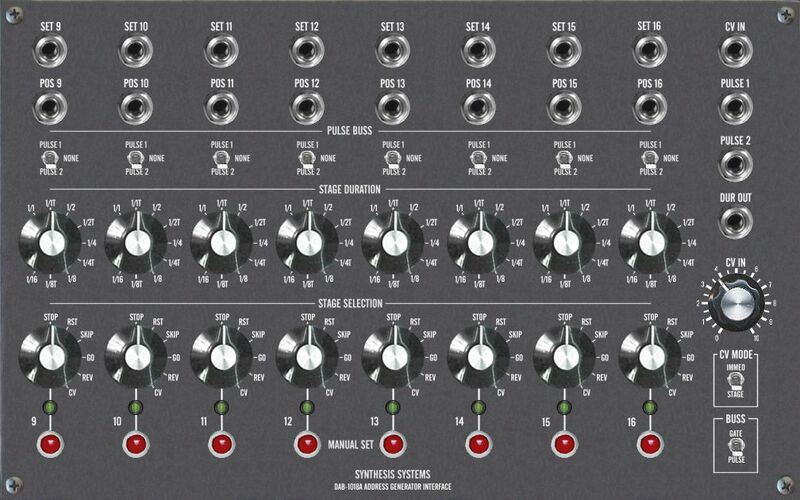 One design goal was to keep the control voltage outputs 100% analog (no DACs); another was to include every cool feature ever present on every sequencer ever designed<g>. Note that this is a classic step sequencer system, not a more elaborate pattern sequencer. 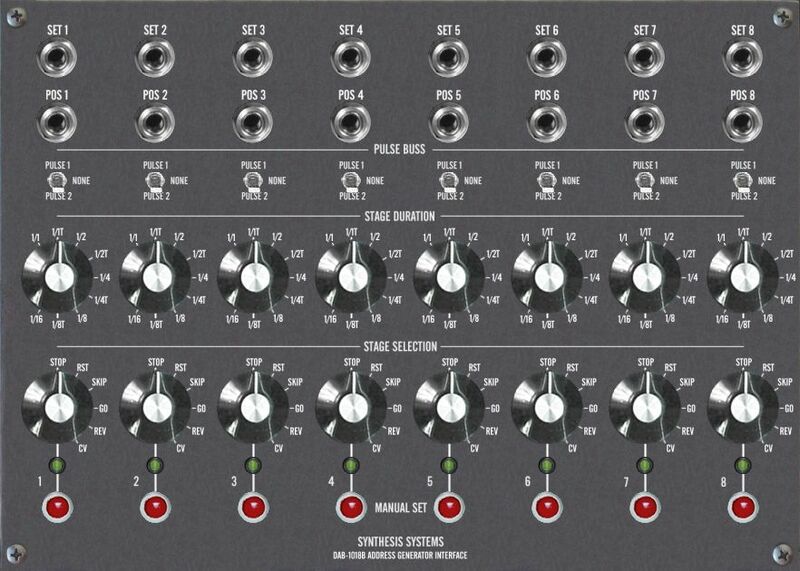 A pattern sequencer is a different animal, and would make a great complement to this step sequencer system. However, I think I'll leave the pattern sequencer design to Synthesis Technologies. I spent many months designing an "all in one 10 units wide do everything" step sequencer. It had voltage control or clock selection of the sequencer stage, 16 trigger switches, and could be switched from 8x4 to 16x2 modes. It pushed the very edge of complexity in terms of being practical to attempt to build it using discrete logic. The panel was huge and crammed full of controls. Then I made another survey of all the sequencers I could find both past and present, found 2 more features I wanted to add, and the whole thing came crashing down under its own weight. So I went back to the drawing board, and repackaged everything in a more modular fashion. When I did this, the whole thing fell into place. I got all the features I wanted by designing several complementary sequencer components, and got the complexity per unit down to where I feel I can still build them using mostly discrete logic. 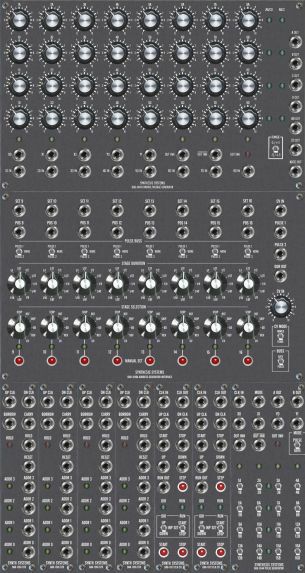 It revives the E-MU system of separating the address generation from the voltage and gate sources, with binary address outputs and inputs to connect the different modules (often normalled behind the panel). The pot matrices are spaced slightly closer than standard MOTM spacing - 1 1/2" vs. 1 5/8" - but do not feel noticeably more cramped to use. The extra real estate is necessary to add LEDs, etc. Address generation (stage select) modules - these modules accept either clock pulses or control voltages as inputs, and provide binary addresses as outputs on several jacks. Control voltage, gate, and pulse generation modules - these modules accept binary addresses as inputs, and select a stage to connect control voltage, gate or pulse signals to one or more outputs. Multiple modules can be chained from the same address signals. This is the basic module for generating up to 16 addresses. It is nothing more than a 4 bit counter with all the control inputs and outputs exposed. Multiple units can be cascaded by plugging CARRY and BORROW outputs to UP CLK and DN CLK inputs. In addition, the preset input is available on the pcb for external control from the DAB-1018. Inputs - UP CLK, DN CLK, HOLD, and RESET. A red LED indicates HOLD status. Outputs - ADDRESS 0 - 3, BORROW and CARRY (indicates underflow and overflow). Amber LEDs indicate the current binary count. This 8U module was designed to provide flexible real- time live performance capabilities for the sequencer. It connects to a DAB-1016 behind the panel and takes over control of the counter. Notice that the jacks are at the top of this module - it is designed to be mounted in a smaller performance enclosure close to the performer. Each of the 8 stages contains two rotary switches, a pushbutton, and an amber indicator LED. The next stage to be selected is determined by the settings of the mode knob for the current stage. Reversal of direction and stage skipping are supported as well as stopping and selection by control voltage. The pushbutton overrides other settings to force stage selection immediately. An onboard analog to digital converter allows stage selection by control voltage. The CV input may be set to immediately override everything, or to select the next stage only if desired. A pulse/gate buss allows two outputs for driving other modules, and can provide gates or pulses. The second rotary switch selects a fixed control voltage to be output from the 1018's DURATION jack. These are used to control a 1V/Octave VC Clock in musical terms of quarter note, eighth note, eighth note triplet, etc. Inputs - CV IN, SET 9-16, pushbutton SET 9-16. Outputs - POSITION 9-16, PULSE 1, PULSE 2, DURATION CV. Amber LEDs indicate the current stage. Connections behind the panel - ADDR 0-3, PRESET 0-3, LOAD, RESET (from DAB-1016 Counter); STOP, UP, DOWN (from DAB-1017 Clock Controller); CV, STOP, RESET, SKIP, REV buss, ADDR 0-3, SET 1-8 (from DAB-1018B). 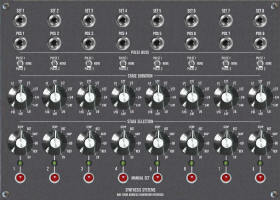 This module is a slave expander to the DAB-1018A and provides control over the other 8 stages. It is 7U wide. Inputs - SET 1-8, pushbutton SET 1-8. Outputs - POSITION 1-8. Amber LEDs indicate the current stage. This is an 8U wide, addressable control voltage source consisting of 8 columns of 4 pots. 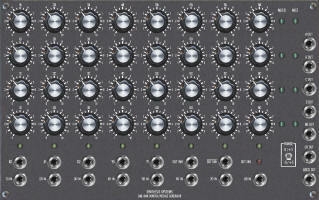 It has built in capability of supplying simultaneous 8x4, 16x2, or 32x1 outputs without mode switching or external patching! This is similar to the Serge TKB ABCD output, but taken a couple steps further. The 8 'D IN' jacks allow for CV or audio signal injection into the D row, for simple wave sequencing or special CV effects. Inputs - X0 - X2 (horizontal address), Y0 - Y1 (vertical address), OUTPUT INHIBIT (positive logic), OUTPUT INHIBIT (negative logic), 1D IN - 8D IN. Outputs - A, B, C, D OUT (8x4 outputs), AB, CD OUT (16x2 outputs), ABCD OUT (32x1 output). 8 amber LEDs for column position. 4 green LEDs for 32x1 row position. 4 green LEDs for 16x2 row position. 1 red LED for output inhibit status. This module turns a free running clock or LFO into a controlled clock. It contains both inputs, switches, and pushbuttons for starting and stopping the clock outputs. 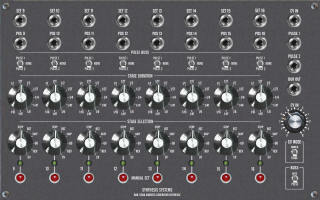 The outputs appear at either the UP CLK or DN CLK jacks depending on the direction, which is set by inputs or a switch. Both the run and direction states are controlled in the same manner - for instance, if the RUN switch is in the middle INPUT SET position, a pulse on the START jack causes the clock to run until the STOP button is pressed or a pulse is sent to the STOP jack. If the switch is set to START, the clock runs unless a logic level high is present at the STOP input, and starts again when the high is removed. Setting the switch to STOP works similarly - the clock is stopped unless gated on by a logic level high at the START input. Inputs - CLK IN, START, STOP, UP, DOWN, START, STEP, and STOP pushbuttons. Outputs - CLK OUT, UP CLK, DN CLK, RUN OUT (provides a pulse when run state starts). Two bicolor LEDs for direction and run states. This module has two LFOs, optimized as clocks with 1V per octave inputs. Each has a PULSE only output, and a PWM input. When no PWM input is present, the output is square. When the DUR output of the DAB-1016 controls the frequency, rhythmically accurate variations may be obtained on the fly by switching the durations to different intervals. Inputs: 1V/OCT A, 1V/OCT B, PWM A, PWM B.
Outputs: OUT A, OUT B. Two red LEDs indicate rate. So how can I use all this stuff, you ask? 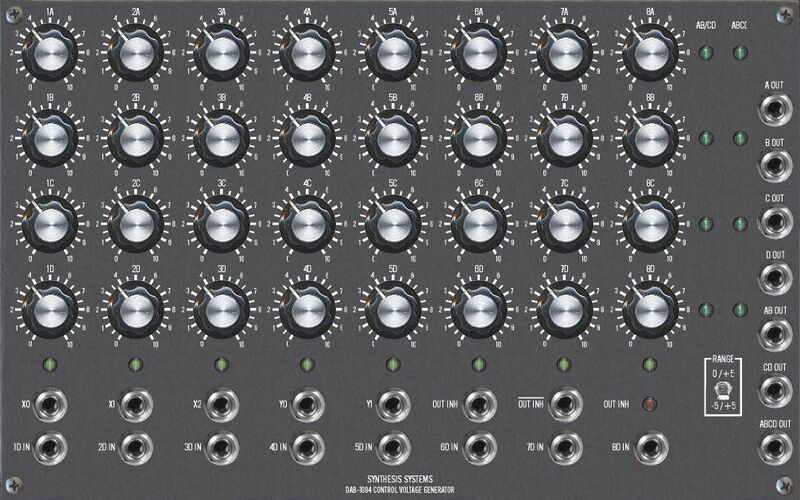 Take the 8U CV Source, add the 1U Counter, and the VC Clock (or just use any LFO), and you have a nice, full-featured sequencer for 10U total. Think big! Take 2 8U CV Sources, add the 7U and 8U Interfaces AND two 1U Counters plus the Clock and Clock Controller, and get a monster 8x8, 16x4, 32x2, or 64x1 (need a 2 input mixer for this last config) sequencer (35U total). Alternatively, patch them into two independent sequencers. Take the 8U CV Source, don't use an address generator at all, but drive the address inputs directly from random logic signals (8U total).